Does gender bias hurt female candidates? The number of women holding political office in the United States has grown substantially over the past two decades. But even with a near-record number of 86 women in Congress today, men still outnumber women by more than 5-to-1. Historically, women faced significant disadvantages in running for office and winning voter approval. Experts say those barriers are lower today, but perhaps not completely gone. Within Congress, female lawmakers have helped bring greater attention to some issues affecting women, families and children, but partisan divisions have thwarted some of their initiatives. 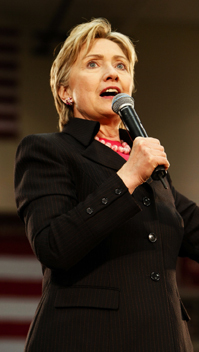 Meanwhile, Sen. Hillary Rodham Clinton, the former first lady, is waging the most formidable presidential campaign by a female candidate in U.S. history. But many of her supporters say her campaign has been hurt by still prevalent sexism in media coverage of the race.